Soda is the most frequently consumed soft drink in the Unite States, with its availability exceeding that of milk, according to the North Carolina School Nutrition Action Committee. Consumption of this carbonated soft drink has gone up an astounding 500 percent in the last half-century, in part thanks to larger container sizes of soda. A standard size in the 1950s was 6.5 ounces compared to today's 12-oz. cans and 20-oz. bottles. Though they are tasty, carbonated beverages can have undesirable health effects. Carbonated soft drinks are associated with increased risk for fractures, according to research by Robert P. Heaney and Karen Rafferty published in "The American Journal of Clinical Nutrition." Overall, this is most likely because people choose soda instead of milk or other beverages that contain calcium, the study authors conclude. However, they also note that caffeinated soda leads to increased calciuria, or calcium excretion in the urine. Caffeine intake is associated with slight reductions in bone mineral in elderly folks, according to a study by C. Cooper in the "Journal of Bone and Mineral Research." An analysis by Lenny R. Vartanian et al. published in the "American Journal of Public Health" reports that reducing soft drink intake by one 16-oz. glass daily is associated with an increase of 4 oz. in daily milk consumption. Drinking too much soda raises your risk for obesity, and frequency of being overweight goes up by 60 percent with each sugar-sweetened soda consumed daily, according to a study by D.S. Ludwig et al. published in the journal "Lancet." Diabetes risk is increased as well. A 2004 study published in the "Journal of the American Medical Association" found that women who consumed one or more soft drink serving daily, which is less than the U.S. national average, had twice the risk of developing diabetes as women who drink less than one serving per month, according to lead study author Matthias B. Schulze. The study followed a group of women for eight years. "This result alone warrants serious concern about soft drink intake, particularly in light of the unprecedented rise in type 2 diabetes among children," Vartanian wrote. 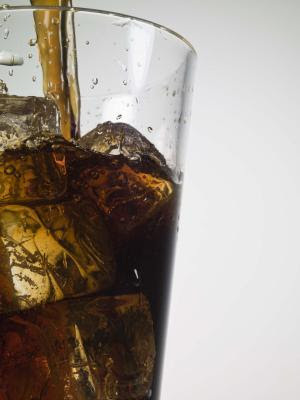 Carbonated soft drinks can harm your teeth, according to a study in the journal "Nutrition" by C.M. McKay and Lois Will. The phosphoric acid in that's found in cola drinks might be partly responsible. However, a study by Katherine L. Tucker et al. in the "American Journal of Clinical Nutrition" notes that total phosphorus intake is not significantly higher in people who drink cola daily than those who eschew cola, though the calcium-to-phosphorus ratios are lower in cola drinkers. A study by R.F. Majewski published in "Pediatric Dentistry" found that rapid progression of cavities is associated with caffeinated sodas. These sodas also tend to have a high amount of sugar, and the caffeine-sugar combination is likely to blame for increased chance of cavities, Majewski concludes. There does not appear to be an association between cavities and diet soft drinks, notes Vartanian.